One of many tobacco fields in Estelí owned and farmed by A.J. Fernandez. Most people avoid driving the Pan-American Highway at night, especially in the mountainous region of northern Nicaragua where the Estelí valley becomes mired by a very particular kind of darkness, dense and disorienting. The road here is unreasonably narrow and guardrails are nonexistent. Street lights are scarce and so is electricity for that matter. One wrong turn, one moment of distraction could mean a tumble down a steep cliff into the valley floor far below. But here we are, and what was originally supposed to be a trip to the A.J. Fernandez cigar factory in a busy, well-lit town has been rerouted. Our SUV is now headed on this winding and unpredictable highway to the tobacco fields in the dark of night. Our halogens can only do so much, throwing what amounts to a piddling excuse for illumination. Even our high-beams are swallowed up by the mountain darkness. From out of the gloom a roaring semi rounds a curve without warning and comes straight at us at meteoric speed, its lamps a pair of twin comets leaving everyone in our vehicle temporarily blind, including the driver. After the bright lights pass, no one can see anything for a moment and the driver has to guess at the next narrow curve until his vision returns. Or crash into the side of the mountain, which seems far more likely. Prayers are somehow answered and the driver finally turns off the highway to a rickety metal gate near the edge of the road just before another tractor trailer blasts by behind us. Two guards armed with shotguns open the gate and the SUV begins to tread a steep and rocky path. On top of the hill is an idling tractor, and on top of the tractor is Abdel Josef Fernandez. Most know him as "A.J.," the guy with the big factory; the guy who went from nothing to cigar stardom in a short 10 years; and the guy who kicks around on his farms even after dark. Long after the field workers have gone home, he stays and ruminates. Is he night farming? "My friend!" he shouts in a thick Cuban accent. Even in the dark, he's excited to have a visitor. Surrounding us, we later find out, are fields and fields of Criollo '98 tobacco that nobody but Fernandez with his owl-like night vision can see. In the light of the machinery, one can pick up an odd detail—Fernandez has grayed prematurely. A young man still in his thirties, his hair is already the color of smoked pewter, though he still has the face and enthusiasm of a young man. He's always smiling and is quick to classify new acquaintances as friends. "I am a guajiro," he says as he hops off the tractor. "A country boy," and then starts to laugh. Not the laugh of a lunatic, nor quite the laugh of someone who's been out in the sun too long. Just the good-natured laugh of someone who loves being around tobacco. Night farming indeed. Workers tend the fields of a Fernandez farm in Estelí, Nicaragua. The Criollo ’98 tobacco in the ground is still young, but quickly grows to full maturity. Fernandez gets into a pickup truck and drives back down the bumpy hill towards his house, which is up the highway right next to his factory. He's off to catch the rest of "Monday Night Football." That's American football, not soccer, and it's one of the few things that can get him away from his tobacco. Fernandez might be Nicaragua's most ardent American football fan. Why should anyone care about a guy who loiters in his own tobacco farm in the middle of the night? For starters, he is the owner and operator of a cigar factory that churns out 14 million hand-rolled premium cigars per year, larger production than many well-known boutique brands and big enough to put him within spitting distance of large cigarmaker status. If that weren't enough, he's also becoming one of the most prolific farmers in Nicaragua. 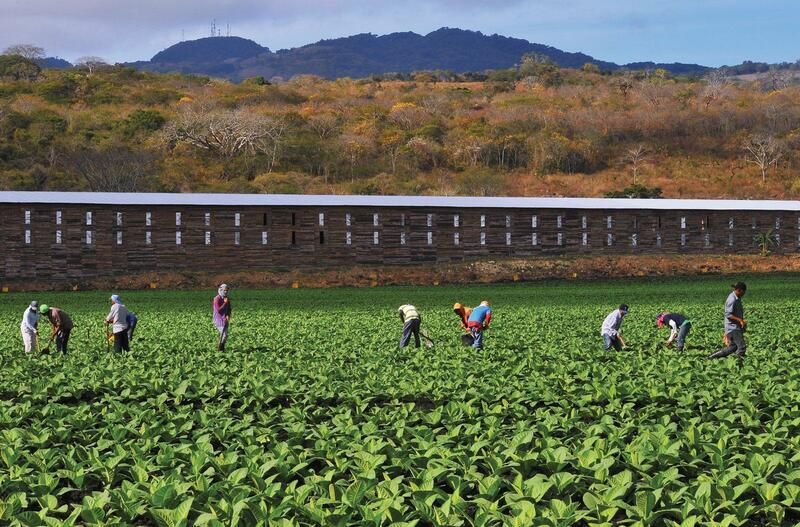 Right now, Fernandez cultivates more than 600 acres of tobacco farms across Nicaragua. That includes 360 acres in Estelí alone, and he continues to buy land to grow more tobacco, even if he has to move a mountain to do it. Not a proverbial mountain, but a literal one. Fernandez has orchestrated a massive excavation project that's literally carving land out of a mountainside, leveling the earth, stone by stone, because he loves the soil. "I prefer mountainside land," says Fernandez. "The nutrients flow downhill." Born in Cuba, his English is limited, but best when talking about tobacco and cigars. Fernandez owns most of the land on which he grows and leases a bit of acreage from a few growers who produce exceptional tobaccos. In addition to Estelí, his tobacco farms across Nicaragua include plots in Condega, Jalapa, Pueblo Nuevo, Quilalí and on the island of Ometepe. Fernandez inspecting tobacco as part of his routine. "In my opinion, the climate in Ometepe is most like Cuba," offers Fernandez. "It's the humidity that comes from being next to the lake." "My opinion," he says again. Many of his statements on tobacco are often bookended with the words "my opinion." It's evident that he's confident in his beliefs, but it's also clear that Fernandez doesn't want to come off as arrogant. In an industry full of hubris, absolutes and obstinately strong opinions, Fernandez is mindful of his tone. At sunrise the next day, Fernandez heads back to the farm to show a visitor how it appears in the sunlight. Plots of land at the foot of the mountain are broken up and overturned from a deep and recent plowing. Because the soil in the Estelí area of Nicaragua is so black, the chunks of plowed dirt look like pieces of demolished asphalt from a distance. Further up the hill, the landscape opens up to terraced fields that are gleaming with Criollo '98 tobacco. This is the San Lotano farm, and the leaves of tobacco here seem to grow thicker than usual and are exceptionally glossy. San Lotano is one of many farms that Fernandez owns, however it's one of his favorites and the one he spends the most time on whether it be for actual cultivation, or simply a quiet place to clear his mind and watch tobacco flutter in the mountain breeze. His namesake series of cigars—San Lotano, San Lotano Oval, San Lotano The Bull—all contain tobacco from this particular plot. Many have scored in the 90s in Cigar Aficionado and Cigar Insider blind reviews. 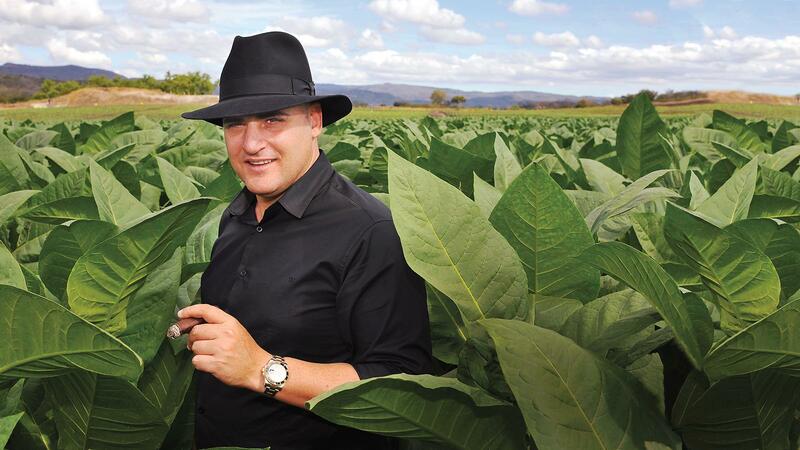 Fernandez grows a mix of tobacco styles on his farms, concentrating most heavily on the Cuban varietals Criollo '98 and Corojo '99. He experiments some as well, trying a broadleaf hybrid he calls 020379. If a client is sincerely interested, he'll make a small run of cigars using a bit of Pelo d'Oro, a finicky, old Cuban seed type that few growers like to plant on account of its susceptibility to disease. One client for this leaf is a German manufacturer of high-end luxury luggage who wanted a cigar to sell alongside his $30,000 bags and suitcases. Fernandez says this purveyor of luggage intends on selling the Pelo d'Oro cigars at $500 each. He chuckles at the idea of someone selling his cigars at such a price, but reserves judgment. "He can sell his cigar for as much as he wants. It doesn't bother me." On a normal day, Fernandez wakes up before dawn, gets into his pickup truck and heads to one of his farms. By midmorning, he's walking through the front door of his factory, Tabacalera A.J. 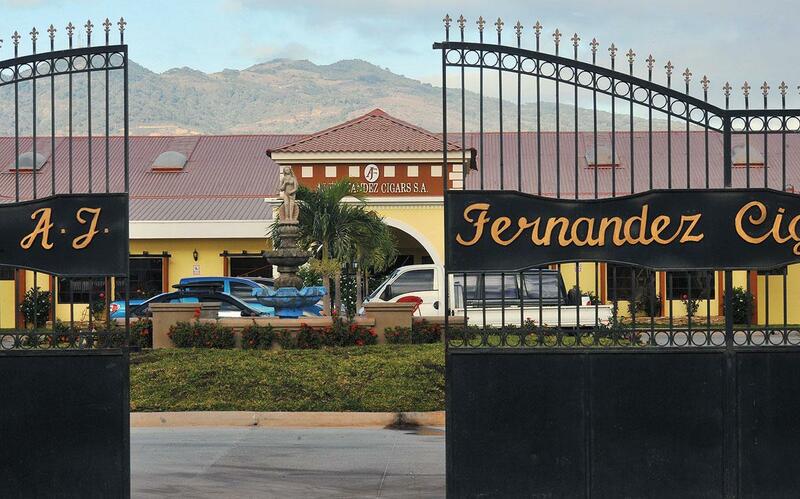 Fernandez Cigars de Nicaragua, located on the outskirts of downtown Estelí, a short drive from his farm. For most of the day, the factory is awash in sunlight. High ceilings and skylights give the entire factory floor an airy feel and natural light. Built in 2013, it only took a few years before the factory was running at maximum capacity and every rolling table was occupied. While Fernandez has his own brands, like the vaunted San Lotano, 60 percent of the cigars made at this factory go to Cigars International, a giant catalog company owned by Scandinavian Tobacco Group. About 10 percent of his production is dedicated to private-label brands and the rest of the workforce produces Fernandez's own brands. If Cigar International's catalog customers don't know A.J. 's name, they know his cigars, most notably Man O' War and Diesel—two brands that have become immensely popular with budget conscious fans of full-bodied cigars. Tabacalera A.J. Fernandez Cigars S.A. is easy to see from the road. Cigars International keeps the factory in business, but the catalog company has no direct financial stake in the operation (despite industry whispers that they've bankrolled the factory). Tabacalera A.J. Fernandez belongs to Fernandez alone. The steady flow of massive business from Cigars International allows Fernandez the leeway to be creative with his own brands. Lines like San Lotano (Top 25 cigars of 2012, 91 points), New World and Enclave, which scored 92 points in Cigar Aficionado for its Churchill size, are emblematic of Fernandez's acumen as a cigar maker. And while his large operation requires him to buy a lot of third-party leaf in bulk, he uses mostly tobacco that he's grown himself for his own brands. As with most factory owners, he's developed methods of fermentation and aging that he feels work best on Nicaraguan tobacco. Unlike other factory owners, Fernandez isn't particularly secretive about the way he runs things. He feels that few people would be willing to put the tobacco through so many long, protracted steps, so he's more than willing to lay out the blueprint for his process. First, tobacco ferments in pilónes (Spanish for piles) for one year with the stems on. Then, the tobacco is baled for two more years, also with the stems. After two years have elapsed, the tobacco is taken out, destemmed, rotated and put through a light fermentation for three months before it spends another nine months in bales again, rounding out a full year. The rest is intuition: another year here, an extra nine months there, depending on how the tobacco behaves. Fernandez clearly obsesses about the quality of his leaf. 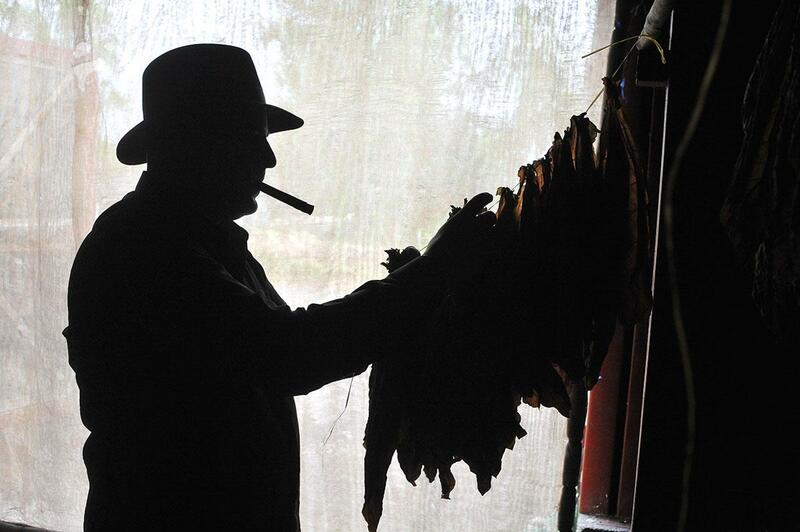 "Because of the way we age our tobaccos, there is no ammonia on the taste," he explains, pointing to his tongue. "It disappears once the cigar is rolled." He's right. A walk from the factory floor into his aging room of rolled cigars supports his assertion. Where there's normally a faint—sometimes even strong—ammonia smell in many aging rooms, there isn't any perceptible trace in his. Cigars go here the day they're rolled in order to stabilize humidity between the different tobacco components. It's also where the blend melds, or "marries," and sniffing a bundle of cigars from a shelf yields only the smell of fresh, rich tobacco. His exceptionally productive factory and growing agricultural operation didn't start off so grand. Fernandez was born in Cuba's countryside, in the San Luís area of Pinar del Río. His father, Ismael, and his uncle worked for the government's agricultural department specifically for tobacco. While he learned from his father, he also learned about tobacco from someone named Riccardo Ledezma. By the age of 13, Fernandez would go straight to a tobacco farm after school called Finca La China. By his recollection, this was the farm where Ledezma grew the first test runs of Havana '92 before the Cuban government approved it for cultivation. He was one of Fernandez's earliest mentors and taught him about planting tobacco, harvesting tobacco by priming and hanging tobacco in the barns. After harvest seasons were over, he'd learn how to sort tobacco. "I wasn't interested in anything that wasn't tobacco," he recalls. This was where he learned how to ferment leaves with the stems on, unpacking, destemming the tobacco and then repacking everything back into parcels for extended fermentation. Meanwhile, his grandfather had a local brand called San Lutano (spelled with a U, not an O) that he sold to people in the area. A San Lutano is the name given to anyone from San Luís. Eventually, Fernandez's father left Cuba to work for his cousin, Nestor Plasencia, one of the largest tobacco growers in Nicaragua. Eight years later in 2003, Fernandez followed his dad. He left Cuba under the pretense of a family visit and didn't return. Not to live, anyway. During his first year out of Cuba, Fernandez lived with his father but got a job with a grower who sold tobacco to the Plasencias. After that, he opened a most modest cigar factory—three rolling tables in his house. Out of familial obligation, Plasencia provided A.J. with tobacco to roll cigars, which Plasencia would then buy. 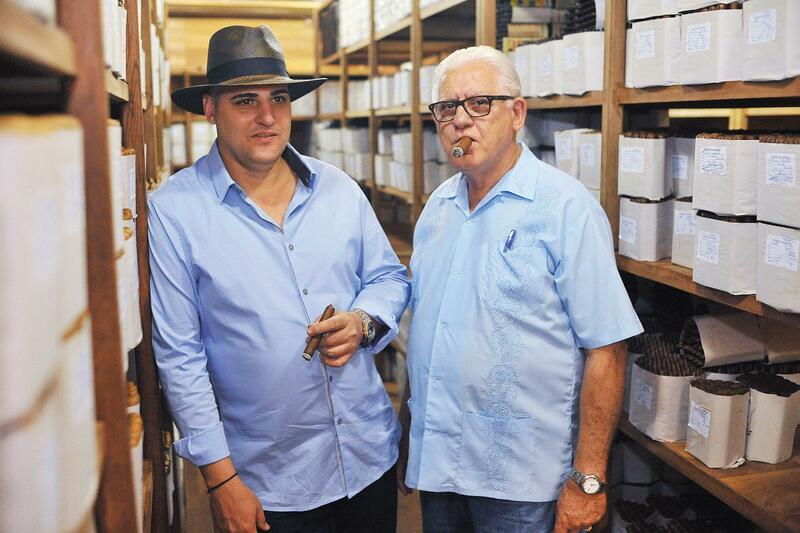 "On three tables, I rolled 20,000 cigars a month for Nestor," says Fernandez. The arrangement didn't exactly make Fernandez a wealthy man, but it did allow him to develop his rolling techniques. Eventually, he started fermenting tobacco in his own home, mostly for experimentation purposes. His first expansion was building an overhang off the side of his house to accommodate 15 more rolling tables. Fernandez's cigar rollers make 14 million smokes a year. Then, A.J. got his first big client: Rocky Patel. Patel contracted A.J. to produce the Fusion line, Signature Series and his seasonal Rocky Patel Winter Collection and Summer Collection. This lead to an even bigger client: Cigars International, the large company that contracted Fernandez to make a few brands. As his operation grew he took on more, most notably Diesel and Man O' War, which have since become catalog staples and can even be found in some retail shops. By 2006, Tabacalera Fernandez was making four million cigars annually, mostly with tobacco that he purchased from the Plasencias. That same year, he bought a 28-acre plot of land in Estelí that he named "San Lotano." "It was virgin soil on a mountainside plot," Fernandez explains. "It's in a valley so it took a long time to level out the land but it came out great." He's been buying land almost every year since, putting most of his money either back into his operation or back into the purchasing of farms. Now, between his large clients, his personal brands and his collection of farms, he's in the enviable position of being both grower and manufacturer. His portfolio is based around the four San Lotano brands but, all told, his factory produces 30 different cigar lines. As to why his grandfather's San Lutano brand became San Lotano, Fernandez says it was a registration mistake. They screwed up the name at the trademark office and he just decided to go with it. "I didn't think he'd be so successful," says Nestor Andrés Plasencia, Nestor Plasencia's son and A.J. 's cousin. "A.J. opened up a factory at a time when many people were trying to open up their own factories, and failing—people with more experience than he had. Naturally I am happy that he's done so well, but I was surprised." His next big challenge is becoming more familiar with the American market. Fernandez split with his former partner Kris Katchaturian last year, who took care of U.S. distribution. Fernandez usually toiled in Nicaragua while his ex-partner handled retailers and consumers. Now that the partnership has dissolved, Fernandez spends more time in the United States getting to know his retailers and establishing a closer relationship with consumers. On the retail level his most popular brands are San Lotano Oval, New World and Enclave. The Oval represents what might be the industry's first ergonomic cigar—its pressed, flattened form and exceptionally rounded edges make it comfortable in the mouth. New World represents a more modern type of cigar—box-pressed, bold and full of potent Nicaraguan tobacco. And Enclave is a more nuanced approach, which he blended with his father, Ismael, who also helps to run the factory. Enclave could be characterized as a more old-fashioned blend and an exercise in restraint. A.J. Fernandez and his father, Ismael, in the aging room, where cigars rest and blended tobaccos marry right after they are rolled. Ismael helps his son with the daily operations in the factory. "I think the American market changes every day," Fernandez explains. "There isn't a lot of brand loyalty. People like to smoke a variety of different cigars. Every blend in my factory is different." Then there's A.J. 's father, Ismael. After years of learning the tobacco trade in Cuba, and then again in Ocotál, Nicaragua, with the Plasencias, he's now joined his son and helps to run Tabacalera Fernandez. There is something almost deity-like about his presence in the factory. His hair is a slicked-back, pearlescent shade of white and he's always on hand to offer soft-spoken guidance to his son. "We don't always agree," Fernandez says of his father. "I'll make a blend and he'll make a blend. Then, we pass it out to some people in the factory and see which one they like better." It's far from a rivalry and Fernandez finds the dynamic entertaining and, of course, part of his learning process. This is one of the industry's unsung father-and-son teams. Another tarry layer of night has fallen on Estelí and Fernandez exits through the front door of his factory and steps into his pickup before turning right towards the Pan-American Highway. He could be heading to his San Lotano farm one last time before going home. He could be going to another farm, further north in Condega. Or he could be going nowhere in particular, looking restlessly in the middle of the night for some dark, unnamed mountain that one day will be scooped out and memorialized with his tobacco.